Made with a natural botanical complex, this hair applicator is designed to increase the moisture and blood circulation of damaged or balding hair. It's natural ingredients will help to enhance the integrity of hair growth. Therefore, minimizing premature hair loss by slowing down the age process and strengthening the hair follicles. ROSEMARY/ROMERO - Stimulates hair growth by minimizing dry scalp and premature hair loss. Estimular el crecimiento del cabello. Es un buen astringente lo cual permite que se emplee en cabellos grasos. WHEAT/TRIGO - Provides the necessary nutrients and minerals to fight against dry itchy scalp. In addition, naturally repairs and strengthens the hair follicle. Ayuda en la nutrición y belleza del cabello. Combate la caspa, repara el cabello y le da suavidad. COCONUT/COCO - Provides moisture while conditioning the scalp to reconstruct and stimulate hair growth. It's also a great source of vitamins E and C.
Sirve para humectar, nutrir y dar brillo y suavidad al cabello. Es rico en vitaminas E y C.
CINNAMON/CANELA - Increases blood circulation to keep the hair folicals healthy. It also softens and adds shine to keep it looking beautiful. Ayuda a prevenir la caída del pelo. Le da suavidad y brillo al cabello. ALOE VERA/SABILA - Conditions the scalp which reduces oiliness and further balding. Also helps balance the pH of the scalp to stimulate hair growth. Made with the best botanical extracts to repair, hydrate and condition dry, process and color treated hair Extracts from coconut, rosemary, aloe vera and jojoba are effective at the hair follicle and shaft restoration and therefore, prevents premature hair loss. The best in smoothing all types of hair to create smooth curly or straight looks. Dominican Magic Smoothing Balm provides maximum smoothness and superior shine on straight and curly hair. 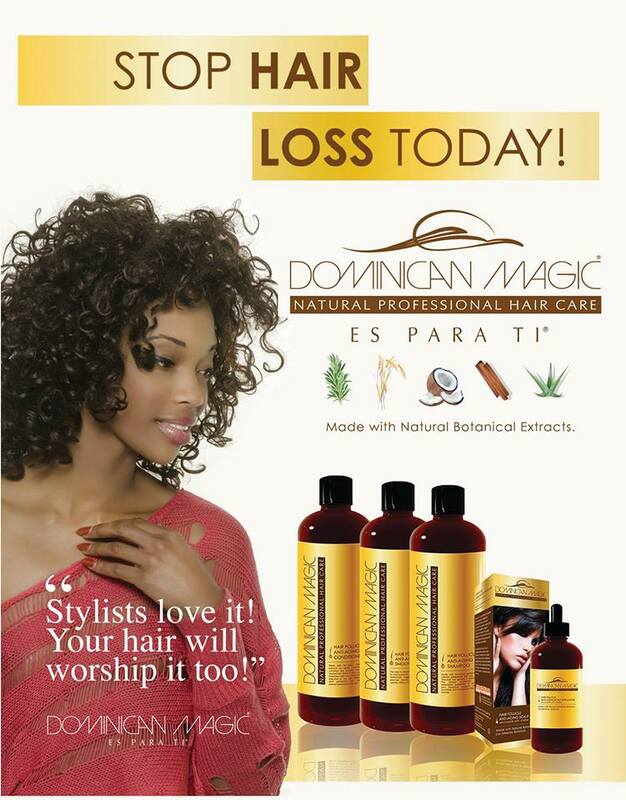 DOMINICAN MAGIC HAIR FOLLICLE ANTI-AGING SCALP APPLICATOR 4 OZ. Made with a natural botanical complex, this hair applicator is designed to increase the moisture and blood circulation of damaged or balding hair. Its natural ingredients will help to enhance the integrity of hair growth. Therefore minimizing premature hair loss by slowing down the age process and strengthening the hair follicles. Este aplicador está hecha con un complejo botánico diseñado para aumentar la humedad en el cabello dañado y frágil. Ayuda a revitalizar la integridad del crecimiento del cabello y reduce al mínimo la perdida prematura. Retrasando así el envejecimiento del folículo del pelo y consolidando la raíz del mismo. The best in smoothing all types of hair to create smooth curly or straight looks. Dominican Magic Smoothing Balm provides maximum smoothness and superior shine on straight or curly hair. Water (aqua), Cetyl Alcohol, Cetrimonium Chloride, Mineral Oil, Alpha Tocopherol acetate (Vitamin E), Fragrance (parfum), Cyclopentasiloxane,Cyclotetrasiloxane,aminopropydimethicone,Dimethiconol, Fragrance (Parfum), Acetamide MEA, Panthenol, Hydrolyzed Wheat Protein, Hyaluronic Acid, Linoleic Acid, Linolenic Acid, Triticum Vulgare (Wheat) Germ Oil, Simmondsia Chinensis (Jojoba) Seed Oil, Sorbitol,Polysorbate 80, Glycerin, Citric Acid,Lactic Acid, L-Ascorbic Acid, Didecyldimonium Chloride, d- limonene. Made with the best botanical extracts to repair, hydrate and condition dry at the hair follicle and shaft restoration to prevent premature hair loss. This conditioner infused with mineral, Age-Control Complex and Color Hold helps maintain moisture, protects from daily stresses and delivers what your hair needs to remain Strong, Healthy and Younger Looking. Este acondicionador esta formulado con minerales y un complejo botánico para controlar el envejecimiento del folículo del pelo y retención de color. Ayuda a mantener la humedad, protege de las tensiones diarias y ofrece lo que tu cabello necesita para mantenerse fuerte, sano y joven. ﻿Water, Cetyl Alcohol, Cetrimonium Chloride, Cyclopentasiloxane, Cyclotetrasiloxane, Dimethiconol, Mineral Oil, Glycerin, Simmondsia Chinensis (Jojoba) Seed Oil, Lanolin, Coconut (Cocos Nucifera) Oil, Fragrance (Parfum), Alpha Tocopherol acetate (Vitamin E), Arnica (Arnica Montana) Extract, Echinacea (Echnicea Purpurea) Extract, Horsetail (Equietum Arvense) Extract, Rosemary (Rosmarinu Officinalis) Extract, Polysorbate 80, Citric Acid,Lactic Acid, L-Ascorbic Acid, Didecyldimonium Chloride. Made with botanical extracts to prevent premature hair loss and stimulate hair growth. Water, Sodium Lauryl Sulfate, Sodium Laureth Sulfate, Cocamidopropyl Betaine, Cocamide MEA,Glycerin, Sodium Chloride, Fragrance (Parfum), Arnica (Arnica Montana) Extract, Echinacea (Echnicea Purpurea) Extract, Horsetail (Equietum Arvense) Extract, Rosemary (Rosmarinu Officinalis) Extract, Polysorbate 80, Mentha piperita (Peppermint) Oil, Citric Acid, DMDM Hydantoin, EDTA, Coconut (Cocos Nucifera) Oil d-limonene. Water, Ethanol, Arnica (Arnica Montana) Extract, Echinacea (Echnicea Purpurea) Extract, Horsetail (Equietum Arvense) Extract, Rosemary (Rosmarinu Officinalis) Extract, Acetamide MEA, Panthenol, Hydrolyzed Wheat Protein, Hyaluronic Acid, Linoleic Acid, Linolenic Acid, Triticum Vulgare (Wheat) Germ Oil, Simmondsia Chinensis (Jojoba) Seed Oil, Sorbitol, Alpha Tocopherol (Vitamin E), PEG-40-Hydrogenated Castor Oil, Menthol, Polysorbate 80, Phenoxylethanol, Mentha piperita (Peppermint) Oil,Cinnamomum Zeylanicum (Cinnamon) Leaf Essential Oil, Barbadensis (Aloe) Leaf Juice.